Walking around Maybee, Michigan on a little photo expedition, we happened across Barker's Trading Post and Auction. One of theÊProprietors notices us walking around outside checking out their buildings and invited us in to check out their auction barn. I cranked the ISO to 1600 on the D700 for its first real test at higher speeds. 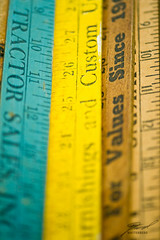 While I should have spent more timing working these fun yard sticks, the results of these high ISO photos are stunning. I'm glad to know that I'll be able to push that ISO setting at least to 1600 and get images measuring up to my expectation for printing.